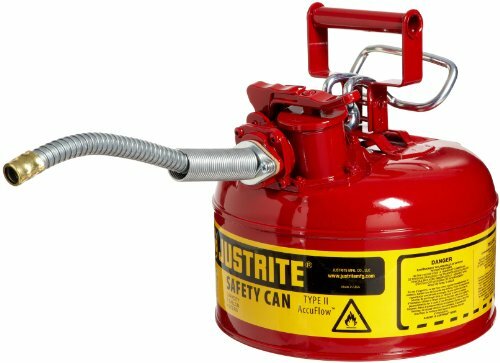 Durable galvanized steel Type II AccuFlow safety cans offer the most convenient, safest way to store and dispense flammable liquids. Built to meet OSHA and NFPA 30, they have been independently fire tested and approved by FM, and UL. Flexible metal hose is 9" x 5/8” (229 x 16) long to reach small openings. U.S.A. Tank Size 1 Gallon (4L), Dimensions O.D. x H (in. ): 9½" x 10½" (241 x 267).